De Sá is currently teaching and researching at the Universidad Nacional in Bogotá. He will return for the summer of 2018 as part of this award. He recently led a National Science Foundation-funded project that resulted in the discovery of three new frog species in Brazil’s Atlantic Forest. The frogs, commonly known as humming frogs, look similar to species already known to science, but have distinct genes and minute physical differences that set them apart. 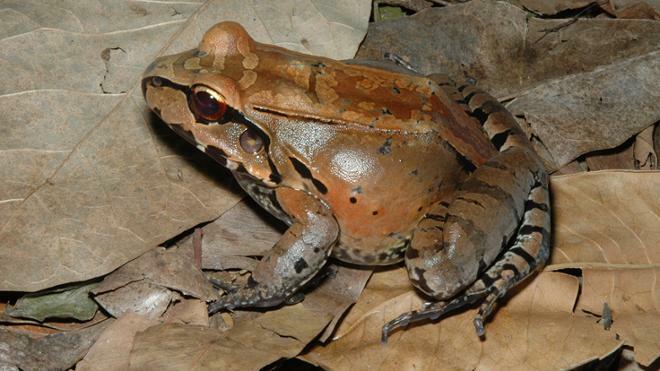 In Colombia, de Sá will focus on the Leptodactylus species, commonly called ditch frogs. While in Colombia de Sá will teach a graduate/undergraduate course, give presentations related to his research on amphibian biodiversity and further strengthen existing relationships with colleagues in Colombia. He will also give presentations to early career and post-doctoral scientists related to grant writing, funding opportunities and U.S. funding agency processes, with the goal of deepening collaboration between Colombian and U.S. scientists. De Sá has taught at the University of Richmond since 1992. He previously held a Fulbright Distinguished Chair in Sao Paulo, Brazil. He received his bachelor’s degree from the University of Uruguay, masters from the University of Kansas and his Ph.D. from the University of Texas-Austin. The lead image is courtesy of Celio Haddad.